Outdoor uninterruptible emergency lighting inverter system 3KVA-8KVA. Provides full light output for a minimum of 90 min. for any type of lighting load. This fast transfer inverter is 98% efficient at full load. 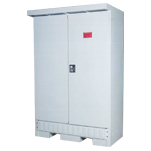 Ideal for outdoor use; NEMA 3R cabinet.